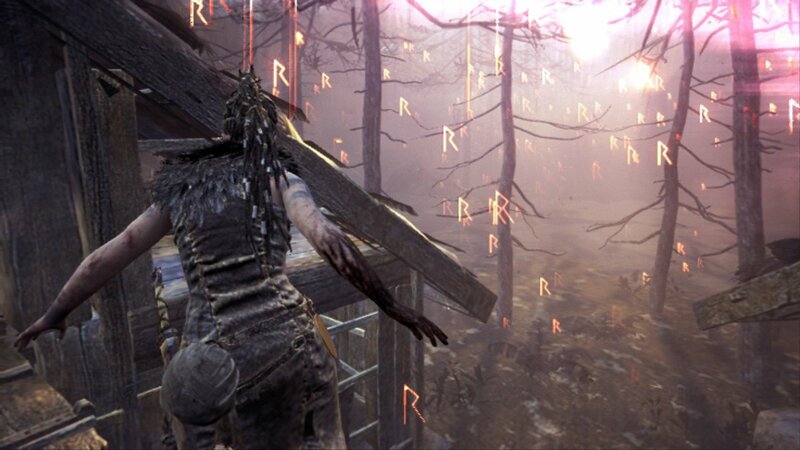 The critically acclaimed Hellblade: Senua’s Sacrifice won a whole host of awards back in 2017 on PS4 and PC, so hearing that the game was coming to Switch sent ripples of excitement through the NL office. Ninja Theory, the studio behind Heavenly Sword, Enslaved: Odyssey to the West and DmC (the 2013 Devil May Cry reboot) specialises in ‘independent AAA’ games – at least it did until Microsoft acquired the studio last year – and Hellblade’s dark, psychological brand of action-adventure looked like an ambitious project for a Switch port. With Microsoft getting particularly cosy with Nintendo of late, it’s no surprise that this version of Hellblade continued production unabated, but can it really hold a candle to the original game? From the first moment you boot it up on the handheld, it’s hard to understand just how QLOC, the company trusted to bring the game to Switch, has managed it. The static close-up of Senua’s face on the title screen sets the tone to follow, as do the ambient screams and ominous chords. 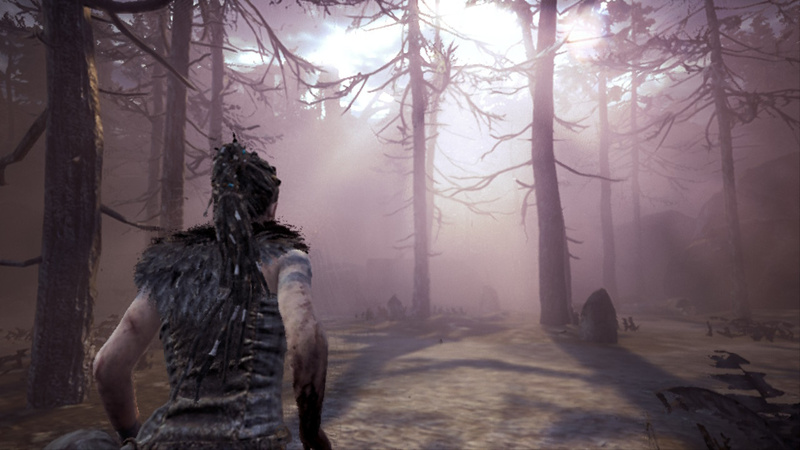 Simply put, Hellblade looks stunning on Nintendo’s console. QLOC has done sterling work. Weighing in at a hefty 18.2GB, texture quality is generally much better than we imagined it could be. Senua herself looks fantastic – the fur ‘ruff’ she wears looks, well, it looks like fur! 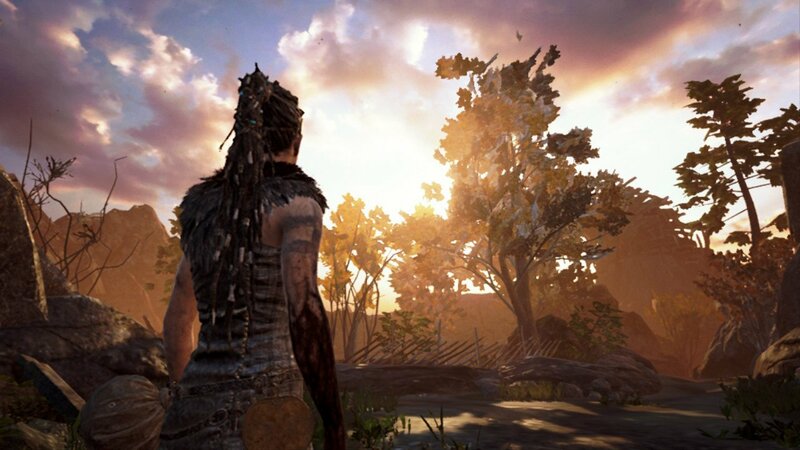 Various effects are employed to reflect her fractured perception and they, coupled with depth-of-field effects, arguably help to disguise some of the changes to this version of the game, but Hellblade really stands up visually on the Switch. It’s not perfect, of course and eagle-eyed fans will note the concessions QLOC has made; although it runs at a relatively smooth 30 frames-per-second, minor hiccoughs occur as you move between some areas, and you’ll notice the odd bit of texture pop-in or shadows loading as you enter an enclosure. 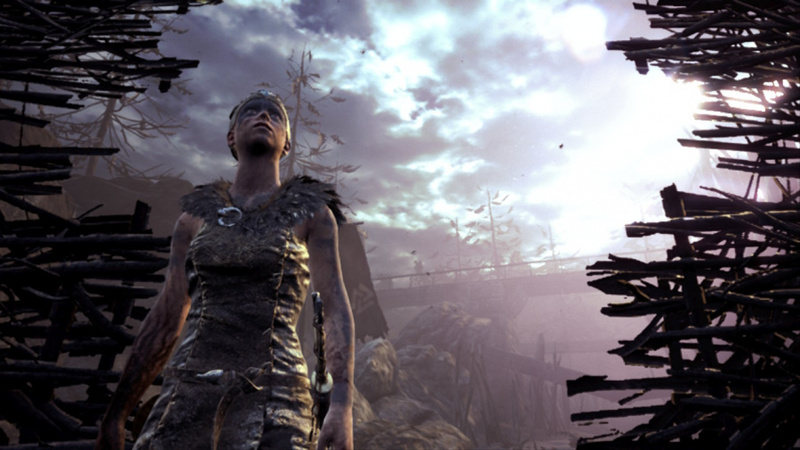 Senua’s hair clips into her back sometimes, and dynamic resolution appears to be employed to keep things running smoothly; handheld mode is a touch blurrier, although the smaller screen helps. Digital Foundry’s customary analysis will be fascinating, but a cursory comparison via YouTube reveals that lighting and foliage quality have been reduced, too. However, playing Hellblade in this way – analysing framerates and foliage – is to completely miss the point when the Switch version more than hits the minimum fidelity required to tell its story with aplomb. It’s a dark, intellectual combat-horror game and QLOC’s port ensnares the player in its world very effectively. Reviewing the game forces us to draw direct comparisons with existing versions and adopt an unnatural approach. The average player wouldn’t – and shouldn’t – have PS4 gameplay videos running side-by-side for comparison’s sake and, to be frank, we were sorry we had to disturb our time with Senua to do so, but it’s a necessary evil for the review; you can enjoy the journey uninterrupted. The game is a narrative triumph as well as a technical one. It’s won umpteen awards in various categories and garnered particular praise for its depiction of a protagonist with psychosis and mental instability. Drawn from Norse mythology, Senua’s journey to Helheim to avenge her lover has her confronting surreal enemies and constantly questioning what’s real or imagined. Although it does involve some chunky, satisfying swordplay, it’s a disquieting, exploratory experience – certainly not something to embark on lightly or if you’re simply after some relaxing, free-flowing video game violence. You’re given time to ruminate and the developers take pleasure in unsettling you with ethereal voices and disturbing noises. It’s a cerebral game with a slow, considered pace. By ‘cerebral’, we don’t mean you’ll be solving intricate puzzles, although you’ll encounter some conundrums which usually involve finding environmental features to match runes that unlock gates. The game uses excellent audio design to block you in, to ‘cage’ you with Senua’s conflicting thoughts. The environment is wonderfully crunchy and squelchy by turn, but voices occupy the stereo sound channels in a very intimate way, even when you’re playing on the TV (binaural sound though headphones enhances the effect even further). The sound is beautifully crisp and close, providing an intimacy that’s unsettling and comforting in equal measure. The motion capture used to bring Senua to life is a cut above the average fare, and the attention to detail that Ninja Theory put into her character model really helps build a relationship between you and protagonist as she deals with the internal mental conflict. As well as mocking and casting doubt on her actions, the voices also coach you and the game is pleasantly devoid of an explicit tutorial. From a gameplay perspective this is refreshing, although it did mean we missed a couple of features until later on. Hitting ‘ZR’ outside of combat zooms in and focuses Senua’s attention on the various sigils and environmental features she comes across, but in combat it also activates a ‘witchtime’-style slowdown mode, although we went through the first few hours (the game’s only around 8 hours long) without knowing it was there. With every failure and death a creeping pestilence called ‘dark rot’ worms its way further up Senua’s arm; you’re threatened with having to restart your game completely if it reaches your head. There are echoes of From Software’s Dark Souls in both this and the combat, although it’s Dark Souls by way of Resident Evil 4 – everything feels very tank-like and cinematic with its over-the-shoulder perspective. 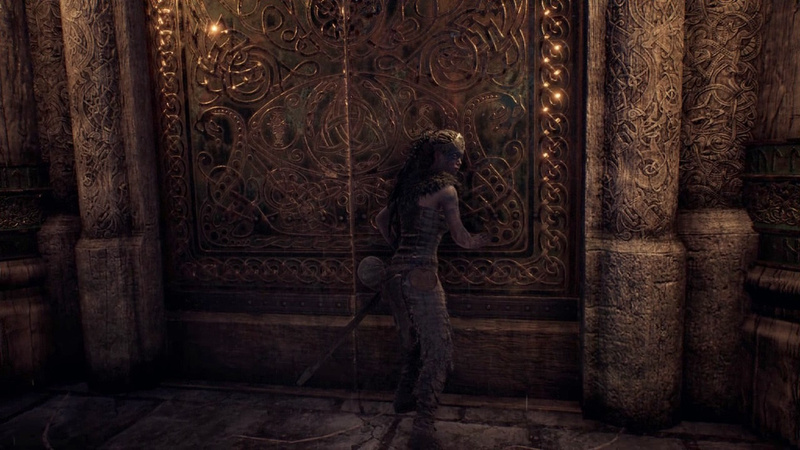 Senua draws her sword automatically when an enemy materialises. Dodge is on ‘B’ with a melee attack on ‘A’ and fast and heavy sword strikes on ‘Y’ and ‘X’ respectively. You can block with ‘R’, although we rarely used it. Motion controls are included in the Switch version, although again, we played for several hours without realising. Holding in ‘ZR’ to focus activates the gyrometer allowing you to look around using the Joy-Con. It works well if you’re into that sort of thing and is entirely unobtrusive if you’re not. Despite familiar echoes and mechanical touchstones from other games, Hellblade’s psychological bent and the constant voices in Senua’s (and therefore your) head give it an identity very much of its own. Again, though, as game enthusiasts it’s difficult to separate our admiration of the technical aspects from the game itself. On one hand it’s a shame to focus on the tech behind the game when the narrative is equally remarkable, but it’s continually astonishing to see what the Switch can do in the right hands. We’ve seen incredible feats already from the likes of Panic Button, with DOOM and Wolfenstein II being the go-to examples of ‘miracle’ ports, but those games are always couched in qualifications. They’ve been squeezed onto Nintendo’s handheld hybrid against all odds – hugely impressive games considering the hardware limitations. Hellblade certainly joins their ranks, but arguably goes a step further thanks to its slower pace and profound narrative. Caveats still exist, of course, but they aren’t so nakedly apparent. This feels like an uncompromised vision – a fully realised and rounded psychological tale that just happens to be running on the Switch’s mobile chipset. It’s excellent. To have Hellblade: Senua’s Sacrifice on Switch in this form is a blessing that you shouldn’t miss out on. The game itself is a psychological sensory experience that we thoroughly recommend, but the fact that it’s been translated to Switch in such a complete fashion is the true surprise here. It doesn’t feel like a downgrade at all – it stands proudly alongside the other ‘miracle’ ports on the system, arguably surpassing them in some ways. It’s a remarkable effort and a challenge to other developers who insist Switch couldn’t handle their games. Anything’s possible, it seems, and we take our hats off to QLOC – bravo.